The North Mallorca Lions will be helping local charity Onit with their flower show on April 7, from 11am to 7pm, at the Claustre, in Pollensa. The Lions will have a booth filled to bursting with trademark goodies: homemade cakes and cookies, jams and chutneys. Make sure you stop by and shop, you will be supporting their 2018 cause: helping the victims of domestic violence. Estate agent Leigh Morgan, together with a group of colleagues, friends, and clients, has taken on the Mallorca 312 km, a giant cycle round the island on 28 April 2018. As if the distance is not challenge enough, the total climbs during the race represent a height of 5,050 m (16,410 feet)! Please donate through his GoFundMe page – visit www.GoFundMe.com and search for Leigh (L-E-I-G-H) Morgan, and pledge. He has already raised €3,000 as we go to print, with a target of €5,000. All proceeds go to the North Mallorca Lions to fund their activities in helping victims of domestic violence. Call Ann for more information: 691 079 206. On another note, do you know someone who needs new glasses but can’t afford them? The Lions can get them free spectacles! A prescription is required, and a little bit of paperwork, and the organization will send them a pair of glasses at no charge! Call Susan for more information: 636 914 425. Finally, back by popular demand… The North Mallorca Lions will hold its second annual Day Against Domestic Violence in mid-May, at the Claustre in Pollensa. Details will be given in TOTN nearer the date. 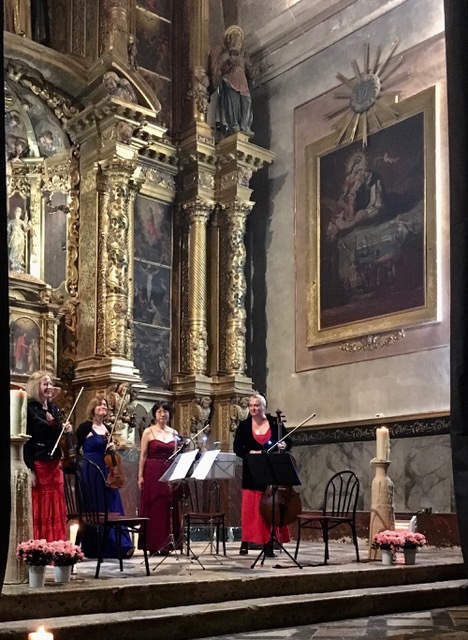 Last month, for International Women’s Day, the Lions held an all-female string quartet concert. The event was free but donations, totalling €500, were raised. All of this will be put towards a new women’s refuge, here in the north. With only one on the island, it is sorely needed.